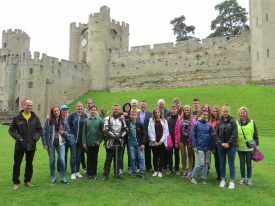 Warwick Castle and Warwick Rotary Club played host to children from Belarus on Monday 14th August as 15 teenagers in remission from cancer from the Chernobyl area explored the best of English castles courtesy of Merlin Entertainments. 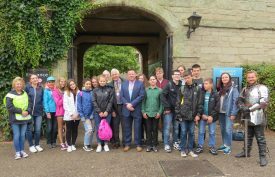 The youngsters were welcomed to Warwick by Deputy Mayor Richard Eddy and John Hibben, President of the Rotary Club of Warwick, which has arranged these visits for the last 10 years. Then it was off around the castle accompanied by costumed actors bringing history to life as a variety of medieval characters. The weather was changeable but stayed dry and a great time was enjoyed, clambering up the ramparts, being shown the skills of archery, and the birds of prey, as well as the castle dungeons. The children had never seen a castle of this type before and were amazed, their particular favourite was the jousting in the newly built area. The charity Chernobyl Children’s Project UK, Solihull branch has brought the children from Belarus for a holiday to restore their health. 31 years after the nuclear disaster the area is still highly contaminated, affecting the air, water, and local produce. The young people visiting this year are all in remission from cancer and were accompanied by their doctor. During a month in the UK they are taken to the seaside, into the country, and eat fruit and vegetables free from contamination, allowing their immune systems to recover and prolonging their lives. The children who have spent two weeks staying with host families in Solihull, are now staying together for a further two weeks in residential accommodation. They were tired but happy after their wonderful day out. Donations can be made to Chernobyl Children’s Project UK, www.chernobyl-children.org.uk,or contact kenkath.ruane@gmail.com for more information. Cllr Richard Eddy, Deputy Mayor of Warwick, and John Hibben, President Rotary Club of Warwick, welcome the party to the castle.